Thank you! I was hoping nobody else had already taken the name. Hi everyone. I just joined now, just stumbled upon this site surfing. I'm a huge Beatles fan. They're my life. I was 5 when they came to America, loved them ever since. I live The Beatles. I absorb everything I can about them. Hi Jopageri! That's one of the nice things about relatively new boards - not having to add random numbers behind your name just to make it work. I got into The Beatles two years ago. My primary school sort of theme song that the rock band always played was Twist And Shout , and towards the end of Grade 6 I decided to look up who it was by. I then looked up some of their other songs, to find that I actually knew quite a few songs, like Hey Jude , We Can Work It Out and Revolution . I knew Can't Buy Me Love , Yellow Submarine and Lucy In The Sky With Diamonds were by them, but I hadn't really listened to any more. Unfortunately, it's pretty hard to come across other Beatle fans around my age, and sometimes people get annoyed with how obsessed I am. I now have both the Mono and Stereo box sets, all the movies except Magical Mystery Tour , several shirts, a poster, and two books. I really want to get some vinyls as well, but I don't have a record player. I listen to other music, like Muse and a bit of Queen, but none as obsessively as The Beatles. My friends all listen to crappy techno, and bag me for liking what I do. They seem to think that how good music is depends on the sales, e.g. "How can you not like Black Eyed Peas? They sell lots of albums, they must be good!" Of course that's bull, but I just bring up the fact that The Beatles have sold over a billion records and they shut up. I figured that here would be a good place to talk with people that share the same passion for their music as I do. Thanks! I can always claim to have been a fan when it was uncool, I guess, ahaha. Thought I'd elaborate on my passion for The Beatles since I have hours before I have to go to work. 3 years ago I escaped from a bad relationship. I basically had to pack a bag and leave. Yadda yadda yadda, we all know about abusive relatioships so I won't bore you with details. Too make a long story short, I ended up back home here in Winnipeg with a suitcase full of vintage Barbies and .37 cents. Took a few months to get back on track and I ended up buying a piano as one of my first "get backs in life" I had NO music so I bought The Beatles Best and started in on it. I am a classically trained pianist but was away from the piano for about 10 years. Wanted something that was MINe. So I learned Lady Madonna , then Hello, Goodbye , etc. Worked my way through 120 songs. Now 3 years later I am proficient in Beatles songs, I bought a bass guitar recently and got goin on Paul riffs, lol. Love it, it's an Epihone Viola model. So, in short, The Beatles are my salvation. They lifted me up and helped me find my way in my new life. Now I'm dedicated to them. My apt. is a tribute to them. My bedroom is covered in posters. I call it my Beatle Bubble. It protects me from all the blue meanies around. lol. LOVE THE BEATELS. I was a big fan before my relationship disintegrated but now I'm a die hard Beatles nut. I'm a huge John Lennon fan too. Followed his solo career, got really angry when he was murdered. Still hurts to think about it, he was just getting his life back together. 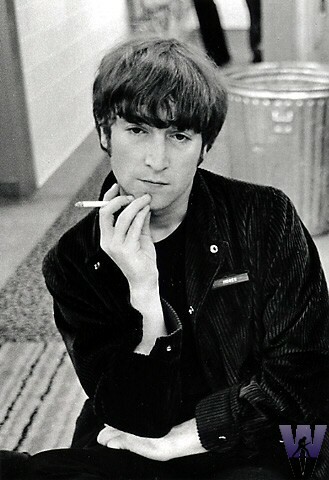 My dad and John were born on the same day - 17 years apart and unfortunaltey they both died on the same day a year apart so John is special to me too. So there you have it. Me in a nutshell. I'll be around lot's. Ttyl..... have a good one !!!!! Wow, a classically pianist and a bass player? We're going to need a youtube band here soon (I'll be the manager). James – compared to what I was interested in in Jr high and high school, I wish I had been a Beatle geek. I probably would have only impressed the band nerds, but oh well. I would have been happy. Hi James, Jopageri. Welcome to the site! Sorry, I've been offline for a couple of days so I'm catching up on stuff now. Jopageri - that's a cool story (apart from the bad relationship bit). Salvation in The Beatles? I guess we've all been there to a degree at some point. Well here I go. My name is Elisa, but I prefer to use a nickname I invented, Mithveaen. I'm 40 year old girl from Mexico and the Beatles have always been a part of my life, because my older sisters were fans. Actually I learned English thanks to them, I used to read the lyrics in the inside covers (is that the name?) from their albums (the ones that have them of course) I learned to read at 5 and with a great desire to read anything that was in my hands, so I remember playing the LP and reading the lyrics. That's how I figure out that English is not read like Spanish and that the words sounded "different". that really changed my life because although I studied computer science in college, now I'm an English teacher. The most precious memory I have from The Beatles is when my sisters took me to a Beatles movie festival, I remember watching one day Help and Sgt. Pepper , the next day Help and A Hard Day's Night , then Let it Be and in a special matinee Yellow Submarine .I was .. I think 9. The saddest memory I have is that I was in the living room doing my homework when my Dad was watching TV, it was American football and there were 3 broadcasters making comments about the game in Spanish (actually you could hear the voices in English in the background), and then , Antonio de Valdez (If my memory doesn't fail me) who's still working on Mexican TV, I still remember the words "said Well the US broadcasting is saying a really sad news for all The Beatles fans, it seems that John Lennon was killed in New York this afternoon. Apparently he has passed away" and the other guys reacted like "Oh God ". My sisters didn't cry, but they were truly sad. I also remember the next day in the local newspaper there was this editorial comic named "A great one is gone" and it said as a caption "Now we will never have a Beatles reunion" and there was a comic of John Lennon in a cloud with an halo and angel wings playing a guitar smiling and saying "At least not on Earth". The following weeks my Dad bought my sisters all the magazines that published old articles and photos, and we made a scrapbook that now is gone. Also, my sister got most of John Lennon 's solo work. Those albums (and some Wings) are also part of my pre-teen years. Another really sad moment for me was reading George's passing in 2001. When I grew up I became fan of many other bands I still love, Mr. Mister, Tears for Fears, U2, and I became interested in other kinds of music like Ottmart Liebert and soundtracks, being my favorite Pale 3 (Tom Tykwer, Reinhold Heil and Johnny Klimek). But although I didn't play The Beatles every day, when someone asked me "What's your favorite band?" I always said "U2.. and The Beatles". or "Tears for Fears.. and The Beatles". So I never stop considering myself a fan. I remember when the Beatles Anthology was released, I was traveling because of work, I remember learning to set up my VCR so it could tape the shows while I was traveling.. I also remember working very hard all day so I could arrive to the hotel and watch the first episode and turn on the radio to listen Free As A Bird premiere (in Stereorey Ithink). I was jumping on my bed screaming when the episode began. The funny thing is, I never got their albums after my sister took hers after getting married. I don't know why. Maybe they were not sold. But as soon as I saw the Blue and Red albums on CD, I bought them spending most of my paycheck that day. Everything changed when I got the Beatles Stereo box set. When I was going through their music, although I hadn't listened to some of their complete albums in years. I was like "I remember that song.. I think it was when I fell off the bike" or "Oh I remember that one… wasn't I listening to it when Mom wasn't home?" So listening to the Beatles is like listening to my chidhood album. I can close my eyes and picture the very same house where I live now and imagine it 30 years younger, and I can see the old furniture, my Mom, my Dad, the twin beds, the old curtains. That's why they're so special to me. I don't like to read about their personal lives written by other people. I don't criticize people doing it at all, I do understand that it's natural to feel attracted to learn more about their personal heroes. (After all I have spent hours watching The Beatles Anthology or videos in youtube) But with the death of John, or recently Paul personal problems, and what really makes me sad, that attack George had, and the problems he had with the doctor and that autograph… I dunno. I remember George saying "We gave our nervous systems". I feel like they have given us their talent, their souls, their music, so asking them to give me their privacy it's like too much. So I don't know much about their personal lives, just what is mentioned in the news. But that's just me. Actually I have to admit I watched a few months ago that movie Two of Us feeling like an intruder, but I really enjoyed it a lot! So I don't say I'll never read a biography. My favorite Beatle? It's hard to tell. If you ask me Lennon or McCartney I say both! I love Hey Jude as much as I love I Am The Walrus . Everytime I see Ringo shaking his head playing the drums I giggle… and I wish I could learn to play the drums actually I play the drums in Rock Band Beatles.. But I must say I've been in love with George Harrison all my life. Everytime I listen to Do You Want To Know A Secret ? I can't help to sigh and feel totally infatuated. But I also feel infatuated when I hear John in Please Please Me , or Paul with Oh Darling, or even Ringo with I Wanna Be Your Man . But yeah, George is the one that has a soft spot in my heart. Well this is me. Wow, I think this was a long intro. Sorry about that. Welcome Mithveaen! Long intros are fine, and your English is perfect as far as I can tell. Do you use English music in your lessons? It seems like a good way to learn. Did you manage to get tickets to see Paul later this month? I heard they sold out incredibly fast and that he had to add an extra date. Thanks! Of course I do. Actually a very experienced English teacher told me to use the Beatles songs because it makes English pronunciation easier for students. I love to have them sing Eleanor Rigby , or Help ! I really like using this one because the lyrics are so fast and easy to pronounce for them that when they get it, they feel like learning a lot. Oh about Paul McCartney concert. Well, it's kind of difficult to buy the tickets, you see they are only sold to people having a specific credit card, I have it, but my sister asked for a loan and I can't use it.. so when my niece was gonna buy our tickets with her grandmother's card... it was rejected. The card didn't have enough balance, so when we wanted to use another credit card, the tickets were gone. I was absolutely upset those days, as we say in Mexico "not even the sun could warm me up". Next day my sister and my niece were close to a really life-threatening experience and I forgot about it of course. But now I read there's a new date I'm crossing my fingers to get tickets next May 7th. I hope. I really want to go. I don't live in Mexico City and my boss knows if I get the tickets I'm not working those days. I'm not making plans before having the tickets, but I really really hope I can go. That's very cool. I didn't have that option when I tried to learn Spanish. I could but still you need a specific credit card to get the tickets. And yeah it's kind of annoying. Many people complain about that, but there's nothing we can do about it.. I just hope I can get a ticket..
Hi! My name is Nina and I am A giant fan of the Beatles. When I was in the begining of my middle school year I started to listen to The Beatles again. They have been in my life since as far back as I can remember. My dad use to play them all the time. There is even a picture of me looking at a Paul McCartney panflit when I was four. So know I have over 200 Beatles songs including my favorites Please Mr. Postman, (Even Though they didn't write it), Hold Me Tight , In my life, and It Won't Be Long . I also am thinking about trying to own The Beatles Cartoons (As you can See in the post I did). I Am curently finishing up watching the Anthology. I have read many books too. Including The Beatles: The Biography (Which I just started), Can't Buy Me Love , And A few more. I am also in the possesion of A Magical Mystery Tour Album, A giant Beatles pillow I made, and A Beatles Hard Days Night Poster. I have 4 Beatles shirts and two sweat shirts (Soon I will be getting a belt). All my friends think im absolutly insane with this obsesion. They always say how the Beatles were A. The Beatles are not good at all and Lady Gaga is better, which personally I disagree with them big time. And B. They were so ugly!! Since I'm a girl I find it very offenceive. Three things you should know about me is I can't spell to save my life, I can on to this website to find people who share my intrest as much as me, and I'm Pretty Young. Well this is mostly is. Oh! And George is my favorite Beatle! I'm Matt, and I love all rock from the 60's/70's era (Kinda iffy on Jefferson Starship). I am a huge fan of the Beatles (fun fact, I am listening to The Night Before right now!). I have every album (except for the rare ones) and the Stereo Remastered Box Set. I've been playing guitar since I was 4 and it is slowly becoming my career. My band, "Wes & Bert" are trying to "remake" the Hard Rock image. I think we've found that tone we're looking for. I play a variety of instruments, including Lute, Guitar, Bass, Cello, Violin, a little Viola, Drums, and Mandolin. My band is currently working on our 4th album "Love isn't real". We haven't made it big yet so you won't see it in Wal-Mart or other stores. We will be releasing it digitally some time in October. Hi BeatleBaby18! So how old are you? We have at least a couple of thirteen year olds here. As far as your friends go, there's no accounting for taste. Anyway, welcome to the site. MrBig: You'll post the link here when you're ready, right? I wouldn't mind hearing your band. You guessed right!! I'm thirteen.